The leader of the United Democratic Party, UDP bemoaning the country’s economic situation coupled with lavish spending of the tax payers’ money has said if the people repeat the mistake of voting for President Yaya Jammeh again they will regret everything forever. “The majority of the youth of The Gambia are ready for change but those in Kanifing Municipality where there is disgusting refusal to properly utilize the tax money of the people in their welfare should take the lead,” he told an overwhelming crowd at the Bakau rally on Sunday 31, January, 2016. Lawyer Ousainou Darboe said Kanifing Municipality has now become filthier under Mayor Yankuba Colley’s era than ever before without any appropriate cleansing service for good public sanitary. He said millions have been spent on events like traditional medicine anniversary, 22nd July celebrations without consideration of the profligacy against the economic interest of the populace. Darboe disclosed that a mere staircase without tiles in the Kanifing Municipal Council is claimed to cost millions, calling on journalists to investigate the matter. He further revealed that road maintenance that involved only the filling of potholes on the road from Rosvelt Road (around Denton Bridge) to Westfield is said to cost about 2 million dalasis. He scoffed at Jammeh’s talks on the type of dress people wear and his witchcraft prattle during dialogue tour. He said the Gambian leader make wasteful expenditure of his speeches on issues that have no national importance for the development of The Gambia. He said President Jammeh is empty for proclaiming Gambia an Islamic State as the constitution which he contravened provided for a secular state in an entrenched clause. He concluded that Jammeh has shamed the Islamic leaders, especially the leaders and members of the Supreme Islamic Council who were present at the scene of his unfortunate declaration. 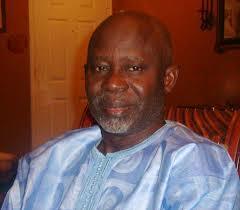 Darboe called on people to get voter cards and vote to remove Jammeh from power.